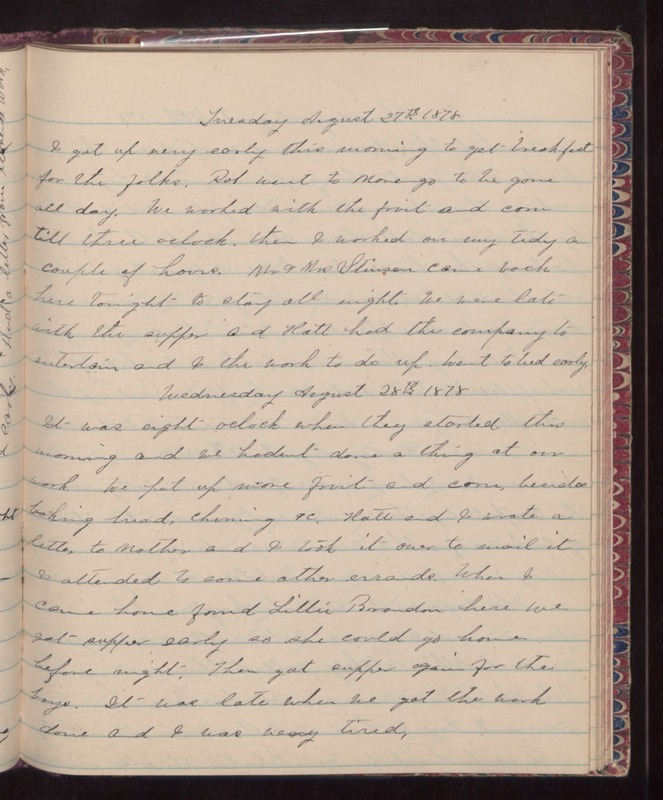 Tuesday August 27th 1878 I got up very early this morning to get breakfast for the folks. Rob went to Monengo to be gone all day. We worked with the fruit and corn till three oclock. Then I worked on my tidy a couple of hours. Mr & Mrs Stinson came back here tonight to stay all night. We were late with the supper and Hatt had the company to entertain and I the work to do up. Went to bed early. Wednesday August 28th 1878 It was eight oclock when they started this morning and we hadnt done a thing at our work. We put up more fruit and corn, beside baking bread, churning, &c. Hatt and I wrote a letter to Mother and I took it over to mail it & attended to some other errands. When I came home found Lillie Brandon here. We got supper early so she could go home before night. Then got supper again for the boys. It was late when we got the work done and I was very tired.